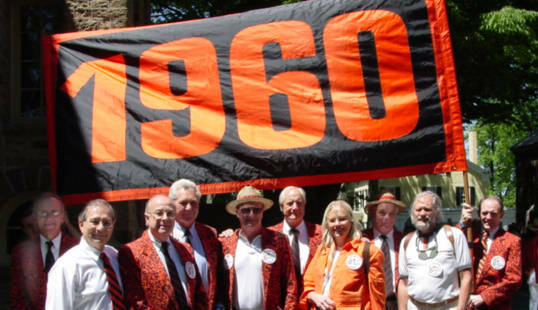 In cool but beautiful weather, to the melodious accompaniment of cicadas, ’60 was represented by 9 classmates at lunch and the P-rade. They were (from left): Willard, Golden, Deyo, Hillegass, Barth, Swan, Joan Sachs Shaw, Ayres, Southwell, and Huettig. Also marching were Carol Golden, Ron and Carol’s daughter [name unknown], and Peggie Hillegass, as well as Kit Huettig’s son Scott ’06, who once again helped to carry our banner. Attending but not marching were Wing, McGlynn, and Bush.